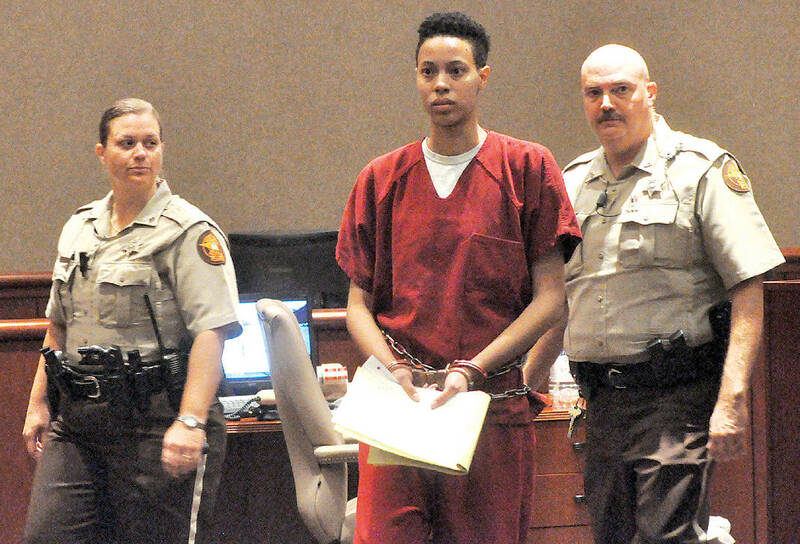 Whitfield County Sheriff's Office deputies lead Skyy Mims into the courtroom for her sentencing in this file photo from March 2014. The Georgia Supreme Court announced today that it has vacated Skyy Raven Marie Mims' theft conviction in Whitfield County. Mims allegedly stole a car in Detroit in early 2014 and drove it to North Georgia, where she planned to further her career as a model, rapper and dancer. In March of that year, though, she stabbed and killed Dahyabhai Kalidas Chaudmari, a Dalton convenience store worker. She then stole a sleeve of scratch-off lottery tickets and drove to the Atlanta area, where the Georgia Bureau of Investigation later arrested her. A jury convicted Mims of several charges, including murder and theft by bringing a stolen vehicle into the state. A judge later sentenced her to life in prison. The murder conviction and life sentence are not affected by the supreme court's order. The supreme court ruled that Mims' attorney was ineffective because she did not ask a judge to separate the murder and the theft charges. She committed the crimes in different states against different victims. Conasauga Judicial Circuit District Attorney Bert Poston, who prosecuted the case, said he disagreed with the supreme court's ruling and may appeal. He does not plan to bring Mims back to Whitfield County for a separate trial concerning the theft charge.